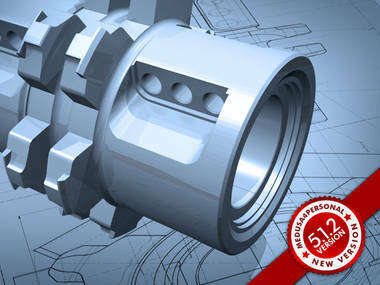 Cambridge, UK and Pittsford, NY – 10 April 2013: CAD Schroer has just made version 5.1.2 of its free MEDUSA4 Personal mechanical CAD system for Windows and Linux available for download. 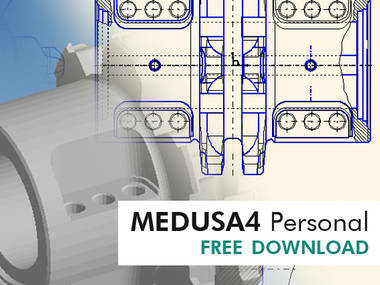 MEDUSA4 Personal is a comprehensive 2D/3D CAD suite, which has a strong reputation among hobby and model engineers, as well as among professional design engineers. People are using the CAD package free of charge on DIY projects, or for detailed model engineering designs. Those working on patent applications or starting or running small businesses can also take advantage of the free software, merely paying a small fee to convert any results that are to be used commercially via CAD Schroer’s eSERVICES portal. Schools and universities are increasingly using MEDUSA4 Personal as an introduction to CAD for the next generation. What’s New in MEDUSA4 Personal 5.1.2? In this release the CADConvert interface offers full support for the DXF/DWG format from AutoCAD® R12 through AutoCAD 2012. It also includes improved handling of special characters and of extremely small and large geometry in imported drawings. The performance of the MEDRaster module for integrating photos and images into designs has been further improved. Version 5.1.2 also includes additional 2D drawing tool and construction line enhancements, as well as improvements to the handling of layers and of extremely large sheets. As well as supporting Windows XP, Vista and 7, MEDUSA4 Personal is released for five Linux distributions: CentOS, Fedora, RedHat EL, openSUSE and Ubuntu.